Swatches, Palm trees and Swarovski Crystals….Oh My! Okay, so I never found my swatch. The new one is on its way. I ordered it this morning along with some new invitation boxes and holders. I can’t wait for my package to get here. It should take about 3-5 business days (with the amount I paid for international shipping, it needs to be here tomorrow!). I decided to wait to meet with Ade until the swatch gets here. We won’t be able to get much accomplished without it anyway. In the meantime, I’m creating the invitation inserts and the wedding programs. Instead of having a rhinestone buckle on the front of the silk box, Ade requested a palm tree and Swarovski crystals. 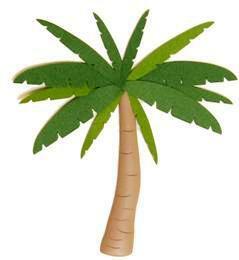 I found a palm tree embellishment (Google is a wonderful thing!). I think I am going to incorporate ribbon and use the palm tree embellishments as a clasp. I’ll have to think about the Swarovski crystals, because I don’t want the outside of the invitation to look tacky. This entry was posted in Embellishments, House of Papier, Invitations, Wedded Bliss and tagged Embellishments, Wedding invitations. Bookmark the permalink.